The Well is a haven, an Eden almost, in a Britain on which rain no longer falls. But at this one particular farm, named for its unfailing well, the rain still falls at night, just enough to keep the grass green, trees in leaf and the farmland fertile enough for crops and animal feed. When Ruth and Mark bought The Well they had no idea that they were buying more than an escape from London. But, in the years since, as Britain dried up and life changed, their fate became tied completely to their home, keeping them there while drawing others to it as well. The Well, though, becomes famous for more than just its inexplicable rain and fertility. As the novel begins, Ruth is returned to The Well as a prisoner under house arrest. She has been found guilty by the draconian emergency water laws but, perhaps no worse than that, she is suspected of murder. In a story narrated in the present tense by Ruth, we are slowly allowed into this troubled woman’s world and memories. We are shown The Well past and present – once the happy home of Ruth, her husband Mark, her daughter Angie and Angie’s young son Lucien and now a prison containing just Ruth and her three guards, each of whom Ruth dehumanises with imagined names. But the past was never that perfect. Ruth is an unreliable narrator. There is a strong sense that her memories are wishful thinking and as they parade before us it’s soon clear that everything was going wrong long before Ruth and Mark arrived at The Well. To some, Ruth is a witch, a murderer or, most especially in the eyes of her husband, a mad woman. To others, Ruth is linked entirely to The Well. To them she is a saviour, someone holy, just as The Well itself is a new Eden. A succession of visitors arrive at the farm – travellers, a religious female sect, a priest, guards. We see them all through Ruth’s eyes and we witness how they change her. But it’s a blinkered, distorted vision, not least as it is revealed to us by a woman near enough destroyed by grief and guilt. 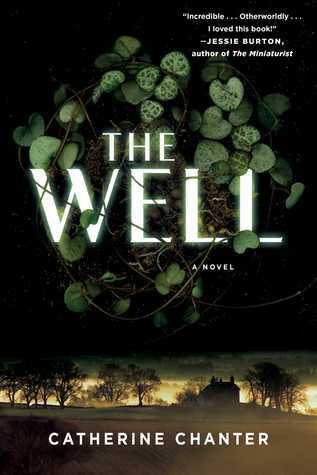 The Well is a powerfully compelling read. Its portrait of a disintegrating, destructive marriage makes for painful reading, lightened by the brief moments Ruth spends with her grandson. Ruth’s relationship with Angie is a difficult one, much of its problems not fully revealed to us. The past is not a place where Ruth feels happy. There is scandal in the past, involving Angie and another involving Mark. The Well was supposed to save Ruth from this. Ruth’s search for salvation is a strong theme – she seeks it with the enigmatic mystical nuns and with the priest. This adds to the mystery of The Well – is it an Eden? If it isn’t, why does the rain stop at its boundaries? And why, if it is somehow holy or unholy, is it such a place of death, despite its life-giving green? Is it evil, or good or simply the place of a weather phenomenon explicable by science? The dystopian mood matches Ruth’s depression and despair. This is not a light read. Ruth’s mind is not always a pleasing place to spend time. But it is a fascinating one. The writing is beautiful, richly evocative of this strange place and this haunted woman. Our feelings towards the people surrounding Ruth are made instinctive due to the power of the prose. But some figures are ambiguous and surprising. It’s difficult to get to know Ruth. Not surprisingly she wants to lay down her feelings but she chooses what to tell. I felt uncomfortable reading parts of The Well. It’s a challenging read at times not least because it is so relentlessly sad. It requires the reader to be in the right mood and, if they are, then it is extremely giving. This is an intriguingly created world, full of intentional holes and blurred colours, set within the wondrous and unknowable nature of The Well itself. This entry was posted in Dystopia, Literary fiction, Review and tagged Dystopian, Literary fiction on March 15, 2015 by Kate (For Winter Nights).